If you need to replace your old boiler, upgrade your existing heating system or even install a new heating system, then you really need a company with both the experience and expertise required to ensure your boiler installation is completed to your satisfaction with the minimum amount of stress as possible. Smart Plumbing are one of the regions leading installers of replacement boilers and central heating systems. We take great pride in our work and believe the customer should always come first. We install the best products at the lowest prices possible. This is probably why we have become one of the largest independent installers of domestic gas boilers in the north of England. We take great pride in our work and we are not happy until you the customer are completely satisfied with the quality of your installation & the service we provide. To date we have installed over a 1000 boilers. This year alone we have replaced over 150 new gas boilers. That is a boiler a day, every day. We only install quality boilers that come with the best parts and labour warranties as standard for your total peace of mind. We know that word of mouth is the best form of advertising. We will do everything in our power to ensure you are a satisfied customer. Excellent boiler with lots more hot water than my old one and very quiet. They fitted it in the day and the workmen were very friendly and tidy. I am glad I chose smart plumbing they were really good and the price was right. I chose Smart Plumbing to install my new boiler for my 4 bedroom home in Sheffield. 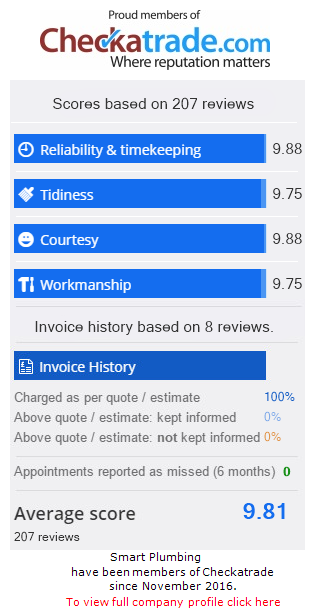 I got 3 quotes and Smart Plumbing were the most professional and offered the lowest price. They recommended the Ideal Logic boiler because it represented excellent value for money. The boiler was installed within one day and they left my property clean and tidy. Unlike most plumbers they turned up when they said they would. Excelant workmanship and very fast and tidy. I am glad i chose smart plumbing. I got my new boiler, a worcester greenstar from Smart Plumbing. I chose a worcester boiler because that is what i had before and had no trouble with it at all. I chose Smart Plumbing because they had been recommended to me by a friend. They did a very good job of fitting my boiler and took only one day. I would happily recommend Smart Plumbing and Worcester boilers to anybody. When my boiler broke down and British Gas told me it needed replacing at a cost of over £3600 i didnt know what to do. British Gas seemed to be very expensive. I asked my son for advice and he said try Smart Plumbing. I called them and they turned up the same day to give me a quote. They were nearly half the price of British Gas and fitted my new boiler the next day. Very fast, professional and afordable.